Billions, possibly trillions, of photographs are taken every year, but very few are exceptional. The Pulitzer Prize for Photography, which is possibly the most famous award given for journalism-related photographs, is given to photographs or collections of photographs that truly stand out. The award has been given yearly, from 1942 forward. Warning: This list contains photos that may be disturbing to some readers. Proceed with discretion. This picture, titled “Aid from a Padre,” won photographer Hector Rondon Lovera the Pulitzer Prize for Photography in 1963. It shows a priest holding up a dying soldier to offer him his last rites amid sniper fire. It was taken on June 4, 1962, during the El Portenazo military rebellion in Venezuela, when rebels tried taking over the city of Puerto Cabello. The priest in the picture is a Venezuelan naval chaplain named Luis Padillo. Padillo carried out the action in full view of the opposing side. It was very unlikely that they would shoot him because his death would most likely become a tool for propaganda. Also, the enemy soldiers were Catholics and would most likely have refused any order to shoot and kill him. What makes the picture even more interesting is its background. In it is a shop on which is written “La Carneceria,” which means “butcher’s shop,” “slaughter,” or “carnage.” The military rebellion lasted only four days (June 2–6, 1962), during which 400 people were killed and 700 were injured. In 1981, Larry C. Price won the Pulitzer Prize for Spot News Photography for his images of the Liberian coup d’etat of 1980. The coup was plotted and executed by 18 noncommissioned Liberian Army officers and led by Master Sergeant Samuel Doe. The Liberian president, William R. Tolbert Jr., was killed along with 28 of his followers. Thirteen of his ministers, who were accused of corruption, treason, and violation of human rights, were put on a hasty trial in which they were not allowed to have lawyers. Four of the 13 ministers were found guilty and sentenced to death, but the judgment was overturned by a “Redemption Council,” headed by Doe himself, which declared that all 13 were guilty and should be executed. The 13 ministers were stripped naked and made to walk round the streets of Monrovia before they were taken to the seaside and tied to poles in preparation for execution. At the execution ground, there were only nine poles. Nine of the government officials were tied to these poles and executed while the remaining four were forced to watch. One of the ministers, Cecil Dennis, faced death bravely, staring his killer directly in the eyes. He was the last to die, surviving the first barrage of gunfire. He was then executed by two soldiers who shot him with a submachine gun and a pistol at very close range. Matt Rainey won the Pulitzer Prize for Feature Photography in 2001 for several photographs of two roommates, Shawn Simons and Alvaro Llanos, who were burned during the January 19, 2000, fire in Seton Hall University in South Orange, New Jersey. The photographs were taken at Saint Barnabas Medical Center in Livingston, New Jersey, where the boys were recovering. The Seton Hall fire, which killed three students and injured 58 others, was started by two students as a prank. They started the fire in Boland Hall, a dormitory which was known for false fire alarms, at around 4:30 AM. Students initially ignored the fire alarm, thinking it was another false alarm. They began to flee once it became apparent that there really was a fire. One jumped from a third-floor window, and two others reported seeing another student burn to death. In the end, two students were burned to death, and another was killed by asphyxiation. Two firefighters, three police officers, and 50 students were also injured. Five of the students were badly burned. Photographer John Paul Filo won the Pulitzer Prize for Spot News Photography in 1971 for several photographs he took during the Kent State University shootings of May 4, 1970. The photograph that actually won the prize was that of a woman, Mary Ann Veccio, who was kneeling beside the lifeless body of Jeffrey Miller. On April 30, 1970, President Richard Nixon announced on national television that it was necessary to draft 150,000 more soldiers to Vietnam for the ongoing Vietnam War. He also added that the United States intended to invade Cambodia. Students reacted to the announcement by protesting and burning down ROTC buildings in campuses across the country. 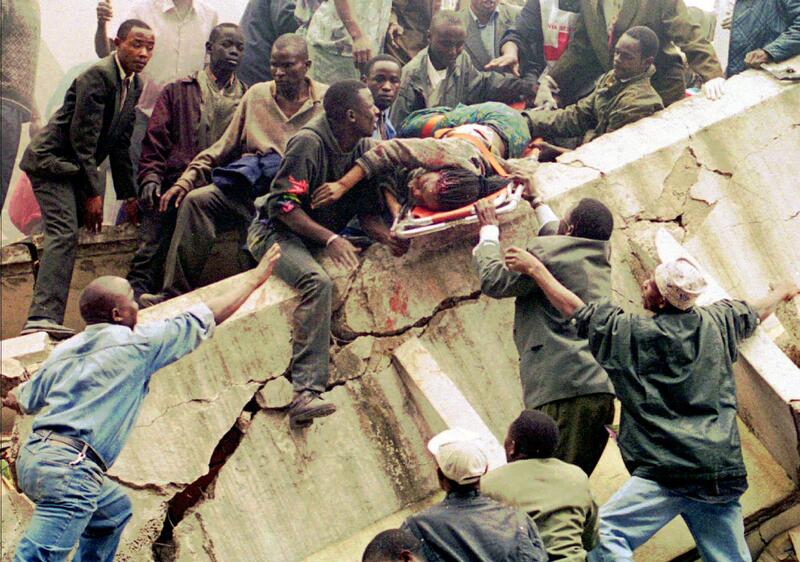 The 1999 Pulitzer Prize for Spot News photography was won by several Associated Press photographers for a series of photographs that they took after the bombings of the US embassies in Tanzania and Kenya. On August 7, 1998, two bombs went off outside two different embassies: the first in Dar es Salaam, Tanzania, and the other in Nairobi, Kenya. The blasts killed 224 people and injured over 4,500 people. The incidents, which would later be known as the East African bombings, forced the FBI to deploy over 900 agents to the affected areas. The attack was later confirmed to have been orchestrated by Al-Qaeda. The explosion at the Nairobi embassy, which was so loud it was heard 16 kilometers (10 mi) away, destroyed a five-story building next door. The embassy itself was seriously damaged; its bomb-proof doors were ripped apart. In Tanzania, one of the survivors said the blast threw him 1.5 meters (5 ft) backward. In 1976, Stanley Forman won the Pulitzer Prize for News Photography for his 1975 photograph of 19-year-old Diana Bryan and her two-year-old goddaughter, Tiare Jones, falling off a collapsed fire escape during a fire at their house in Boston, Massachusetts. On July 22, 1975, while Stanley Forman was about to go home for the day from his job at the Boston Herald, he received a call that a house was on fire. He rushed to the scene and went to the back of the house where he found Diana and Tiare standing on the fire escape. They were soon joined by firefighter Bob O’Neil. A fire truck raised its ladder toward the three of them, but as Bob climbed up the ladder, the fire escape collapsed. While Bob hung onto the ladder with one arm, Diana and Tiare went crashing to the ground from a height of about 15 meters (50 ft). Diana was badly injured from the fall, and she died of her wounds later that day. Tiare survived—because she fell on Diana. The pictures Stanley took were widely circulated, and it made Boston officials rewrite the laws involving fire escapes. It was also used by fire departments in several countries and on pamphlets regarding fire safety for many years. In 2001, Alan Diaz of the Associated Press won the Pulitzer Prize for Breaking News Photography for his photograph of US federal agents, armed with submachine guns, forcefully seizing a young boy, Elian Gonzalez, from his relatives’ house in Miami, Florida. The story began in 1999 when six-year-old Elian was found clinging to an inner tube at sea. He had been on a boat that was traveling from Cuba to the United States. The boat sank, killing Elian’s mother and nine other people. After Elian was rescued, he was handed over to his relatives living in Miami. However, his father, Juan Miguel, wanted him returned to Cuba. The issue soon led to altercation between Cuba and the United States. Fidel Castro himself even led several protests calling for the return of Elian back to Cuba. Meanwhile, Elian’s relatives in Miami didn’t want him to return to Cuba. After several months of legal battles and protests in both Cuba and Miami, it was concluded that Elian would be returned to his father, who was already waiting in the United States, and flown back to Cuba. His relatives in Miami were ordered to hand him over to the Department of Justice, but they refused, prompting Attorney General Janet Reno to order an early-morning raid on their home to forcefully retrieve the boy. Elian was then flown to Washington, D.C., where he was handed over to his father and then flown back to Cuba. Photographer Harry A. Trask won the Pulitzer Prize for Photography in 1957 for several photographs of the sinking ocean liner Andrea Doria, which he took from an airplane nine minutes before the ship completely disappeared beneath the waves. The Italian ship was the last major transatlantic ship that sank before airplanes became the preferred method for crossing the Atlantic. When the Andrea Doria was built, it was Italy’s biggest, fastest, and, as reported, “safest” ship. The Andrea Doria was theoretically unsinkable. It had the latest navigational equipment, including two radars. If the ship collided with another ship, its 11 watertight compartments were constructed such that the ship could remain afloat even if two compartments were flooded. Its lifeboats were also made so that they could be deployed even if the ship tilted by as much as 15 degrees. On July 25, 1956, the Andrea Doria suffered a collision with the Stockholm, a much smaller ship. The Stockholm had damaged the hull of Andrea Doria where its fuel tank was located and also ripped open several of the watertight compartments. Water then began to fill the almost-empty fuel tanks, thus bringing the ship to the brink of sinking. It listed 20 degrees, which meant the lifeboats on its starboard side could not be deployed. Poor internal design allowed the water from some of the internal compartments to run into other compartments, making the list even worse. However, almost all of the people aboard the Andrea Doria survived thanks to several ships, including the Stockholm and, most notably, the Ile de France, that helped with their own lifeboats. The captain of the Andrea Doria, Captain Calama, refused to leave the ship long after the last person had been rescued. He believed that the ship could still be rescued and towed back to port. He ordered the last of his crew to abandon ship and leave without him, but they refused until he finally agreed to leave with them. Of the 1,706 passengers aboard the Andrea Doria, only 46 died, and most of them were killed in the initial collision. The Stockholm suffered five dead—all crewmen. If the Andrea Doria had sunk immediately after the collision, the causalities would have been comparable to those of the Titanic. The 2007 Saffron Revolution in Burma, also called Myanmar, began after the government removed fuel subsidies on August 15, 2007. The removal caused the cost of petrol and diesel fuel by 66 percent and natural gas by 500 percent. There was also a sharp increase in the cost of food and transportation. Protests began, and about 15,000 monks marched through the streets calling for the removal of the military government. On September 26, 2007, the military junta began a violent crackdown on all protests, during which temples were raided and monks were arrested. Winning the Pulitzer Prize for Breaking News Photography in 2008 was Adrees Latif of Reuters for his photograph of the fatally wounded Japanese videographer, Kenji Nagai, who was shot during the military crackdown. Kenji had been covering the protests in Rangoon when government troops suddenly arrived and opened fire on the crowd. Kenji was hit and was lying with his back on the ground when the photo was taken. Even after being shot, Kenji was still recording the scene. In the next photo taken, he was dead with his hands and camera by his side. Video footage of the scene later showed that Kenji was actually pushed to the ground by a soldier and then intentionally shot at close range. He was originally believed to have been hit by a stray bullet. Afghanistan-born photographer Massoud Hossaini won the 2012 Pulitzer Prize for Breaking News Photography. His photograph was that of 12-year-old Afghan girl Tarana Akbari, who was screaming just after a suicide explosion which killed more than 70 people, including seven members of her family. Her family along with several others had gone to Kabul to observe the Ashura festival, one of the holiest days observed by Shia Muslims. The festival is meant to commemorate the A.D. 680 murder of Imam Ali, a grandson of the prophet Muhammad. The worshippers had crowded at the Abul Fazl shrine to celebrate when a lone suicide bomber detonated explosives in his backpack. Massoud was at the scene when the bomb went off and had even been injured in the explosion, which was even condemned by the Taliban. Massoud had taken photographs at the yearly Ashura festival for 10 years and had not been expecting anything unusual. What makes Massoud’s photograph stand out is that, unlike other photographs that were usually taken well after the main event had occurred, this one was taken immediately after; Massoud was there, after all. In 1989, Ron Olshwanger, a furniture dealer who wasn’t even a professional photographer, won the Pulitzer Prize for Spot News Photography. His award-winning photograph was that of Adam Long, a firefighter with the St. Louis fire department, giving mouth-to-mouth resuscitation to two-year-old Patricia Pettus, whom he had rescued from her burning home. Ron had a police scanner and liked to photograph fires. He arrived at the scene just moments before Adam Long emerged from the burning building with the unconscious Patricia. Ron’s photo was purchased for $200 by the St. Louis Post-Dispatch, which ran it on their front page. Long was awarded a medal of honor, and Ron won the Pulitzer. He gave the prize money to Patricia’s mother and sister. However, the story did not end well. Patricia died from complications from the fire six days later. The photograph did one very important thing, though: It encouraged people to buy smoke detectors for their homes.